The day doesn’t begin without coffee. Maybe it does for other people. I’ve heard rumors about such a race of men, though I imagine they must live in a land far from here—Mars, perhaps. Morning coffee is no mere conveyance for caffeine, mind you. Sure, the miracle drug graciously plays its role, but it’s more than that. It’s the warm mug in your cupped palms, assuring you the world is a safe place. It’s the steam whispering up like a siren song, beckoning you, not toward rocky shoals, but toward a calm haven. It’s the aroma of your childhood home. It’s the deep rich color calling you toward the depth of character you desire. It’s the subtle intermingling of sweetness and bitterness—a complexity with which you identify. A medley of hymns from my childhood rings clearly in my heart when I close my eyes and listen. They were completely separate tunes until my mother gathered me in her arms and strung them together as one. It’s impossible to count how often she sang over me, but this I know: it comforted me. Decades later, I gathered my own children in my arms and rocked away the nights in darkened rooms gently whispering that same strung-together-medley: “Jesus loves me this I know…Oh how he loves you and me…Jesus, Jesus, Jesus. There’s just something about that name…On a hill far away, stood and old rugged cross…Draw me nearer, nearer blessed Lord.” Every time I sang over them in love. Every time, it comforted them. I crawled on my knees, for what seemed like forever, after my babies were born. As soon as they stayed awake longer than a feeding, I was on the floor cooing and playing alongside them. When they gained mobility I crawled after them, baby-proofing the house and picking up the debris they left behind. 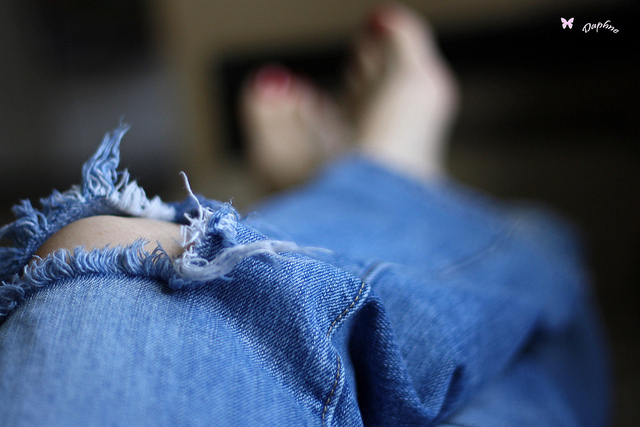 Before kids, a pair of jeans lasted me a few years. Post kids, holes appeared in the knees within a year. I reserved one pair of “good jeans” to wear in public so they wouldn’t show any wear around the knees.